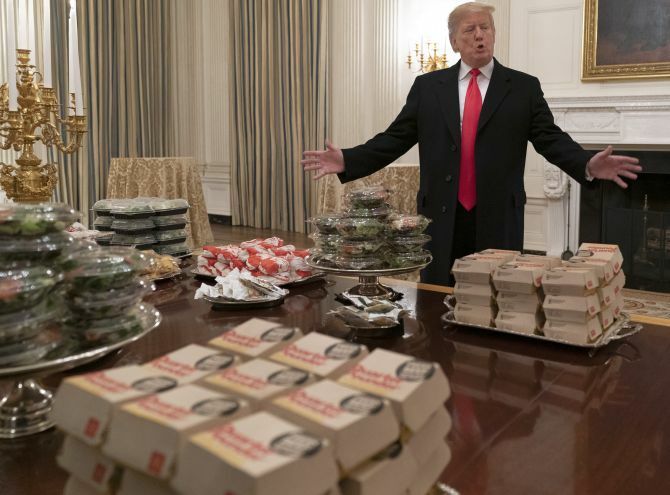 United States President Donald Trump personally ordered an “all American” feast of burgers, pizza and fries for a visiting college football champions as the White House chefs are among those furloughed due to the ongoing partial government shutdown, the longest in the history. On Monday, the Clemson Tigers were invited by Trump to the White House to celebrate their national championship win over the Alabama Crimson Tide. “We ordered American fast food. Paid for by me. Lots of hamburgers, lots of pizza, I think they’d like it better than anything we could give,” Trump said. “The President wanted to host a fun event to celebrate the College Football National Champion Clemson Tigers. 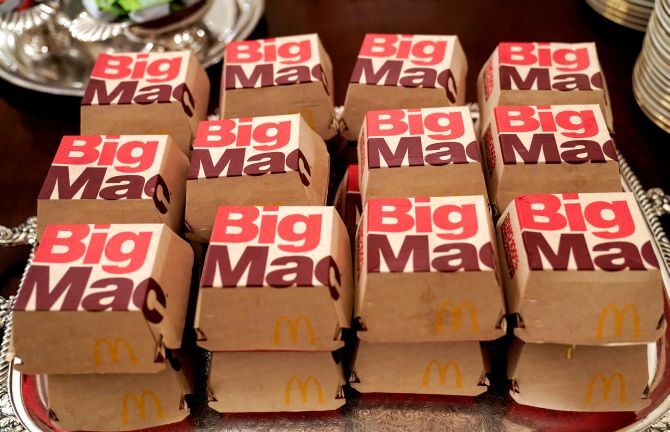 Because the Democrats refuse to negotiate on border security, much of the residence staff at the White House is furloughed -- so the President is personally paying for the event to be catered with some of everyone’s favourite fast foods,” White House Press Secretary Sarah Sanders said. 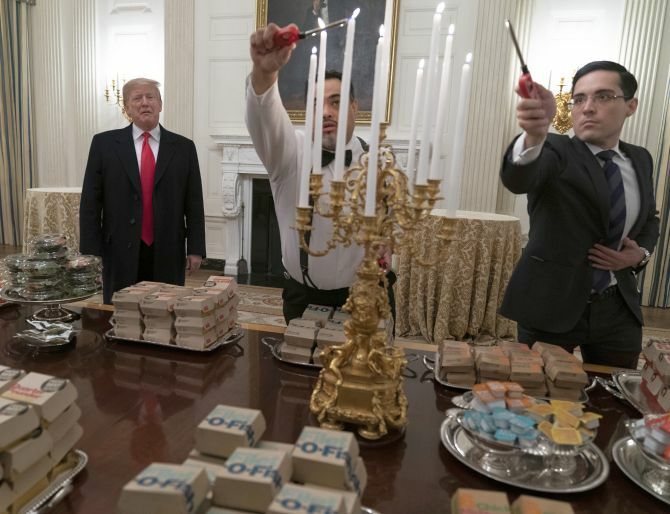 Trump explained to reporters in a lengthy answer to the question what he preferred McDonald’s or Wendy’s. “If it’s American, I like it. It’s all American stuff... But it’s good stuff and we have the national champion team, as you know, Clemson Tigers. And they had a fantastic game against Alabama and they’re all here. They’re right outside the room and I think we’re going to let you see them,” he said. It was US President Trump’s second time welcoming the Clemson Tigers to the White House since the beginning of his presidency. The Tigers last visited in June 2017 after their championship run the previous season. 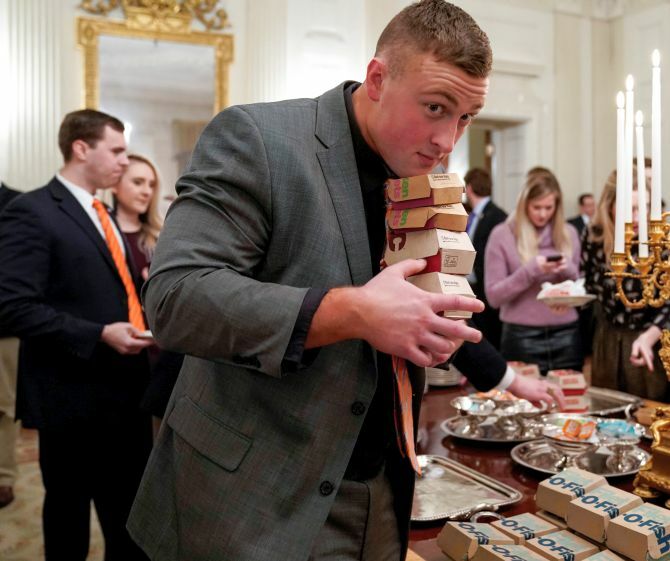 The football players walked into the event and found a table piled high with hamburgers from McDonald’s, Wendy’s and Burger King. Another table was covered with Domino’s pizzas and fries. “But I’ll bet you, as much food as we have -- we have pizzas, we have 300 hamburgers, many, many french fries, all of our favourite foods. I want to see what’s here when we leave, because I don’t think it’s going to be much. The reason we did this is because of the shutdown,” the president explained. “And I will say the Republicans are really, really sticking together. It’s great to see it because we need border security. We have to have it. We have to have it. No doubt about it, should have happened 30 years ago, 20 years ago, 10 years ago. And it’s going to happen now, going to happen now,” he asserted. The partial government shutdown, now into its record 24th day, has furloughed more than 800,000 federal government workers after Trump dug in on a campaign pledge to build a wall on the southern border with Mexico, demanding $5.7 billion from Congress for the project. Democrats have rejected his demand. The shutdown has paralysed some of the key departments, including the State Department and not to miss the White House kitchen. Trump told the players afterward that he did not want to postpone the event until after the shutdown ended.